The animals are in town and on their way to an Asda store near you! 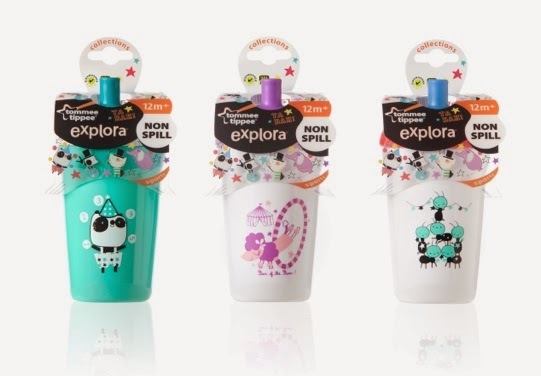 A new collection of decorated cups to make drink time even more fun! The Animal Antics range consists of nine new characters each with a unique skill from podium balancing to tightrope walking! The new characters are available across 6 cup types including 4m+ 1st transition cup, 7m+ beaker, 12m+ Sporty and 12m+Sports Bottle. ABOUT: Rory has been balancing his whole life and takes pride is his performance. Rory likes to make lots of noise during his act, displaying his strength by roaring fiercely and shaking his mane. ABOUT: The Tempo’s are a bird and hippo musical double act. These two have been singing together for many years with birdies sweet voice complementing hippo’s dulcet tone to provide jazzy songs for the crowds to enjoy. ABOUT: Theodore is the Master of Ceremonies and has the very prestigious task of introducing all of the acts. He is also a very talented dancer using a special star ball as part of his act and he always finishes with a loud and clear ‘TA DAH!’. ABOUT: Like Rory, Sarah is an expert balancer. She can take a run up and push herself up to jump and land gracefully on top of her podium. She is known for her elegance when performing and when the crowd applauds her she enjoys clapping her fins together. ABOUT: Ellie is the star of the show and the act the audience loves to see. When Ellie performs, she shows daring acrobatics as she tip toes across a tightrope that is suspended at a great height. ABOUT: Chuckles is particularly clever as he is able to ride expertly on his unicycle and juggle at the same time. But because Chuckles enjoys having a good laugh he is always playing jokes that make him laugh so much he can fall off his unicycle. ABOUT: Because Jazz is a Panda, he has amazing climbing abilities and this has helped him become a great juggling artist. He is able to juggle more quickly than Chuckles and he also likes to juggle along to The Tempo’s lively music. ABOUT: Lulu is one of the great stars of the Animal Magic show. She is able to run fast and jump very high through hoops and is known for her lovely hair and costumes that she makes herself. ABOUT: The Tumbling family have been busy performing their remarkable pyramid for many years. The ants are able to build on top of each other to reach lofty heights then one by one they jump and flip and are caught by their fellow team-mates to safely land. The Animal Antics cups are part of the tommee tippee® explora® range, which caters from 4 months to 3 years and includes cups, spoons, tableware and bibs – all affordable, yet fun, bright and high quality from an award-winning brand you can trust.